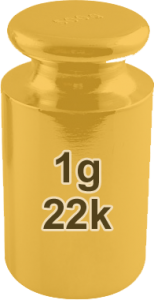 The current 22k gold price per gram is $37.60. This price is live and this page updates every 30 minutes with the most recent gold price. Bookmark this page and come back whenever you need to know the price of a g of 22 karat gold. If you want to figure out the price of any other gold purity or some other weight of 22k gold use out Scrap Gold Calculator now! Prices are figured using troy oz scale and not standard oz. A troy ounce is 31.1034768 grams not the usual 28.3495 grams.